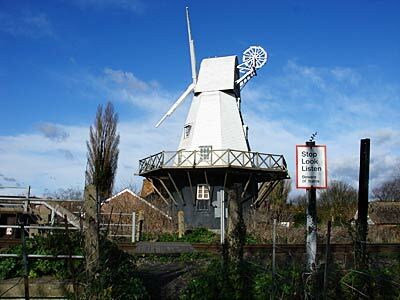 Rye Mill is a grade-two listed building occupying an historic site in Gibbet Marsh where a windmill has stood since at least the sixteenth century. On Friday 13th, 1930, the ovens of the bakery overheated and destroyed the wooden structure on the mill, leaving the two story brick base. Reconstructed in 1932 and used as bakery until 1976, it's now a guest house.